Now I’m prepared to bet that you believe all that media hype and regard white van man as some kind of road-bound scum. So when I tell you that he is more salt of the earth than scourge of the metropolis, you might be a little surprised. Our cities might be kept moving by any number of fluffy green forms of public transport, and linked by train and plane and automobile, but the backbone of British commerce is white van man. The stereotypical image of this character – builder’s bottom (gah! ), smothered in tattoos, battered vehicle making the same size carbon footprint as a small African republic, and seemingly unaware of either parking regulations or indicator control – is just that – a caricature sketched out by some desperate journalist. Today’s panel van driver is most likely to answer to the name of Ali (or Weng, or Andrzej). And, OK, he may not be a master of suave politesse, but nor is he the lane hogging bigot that he’s made out to be (his only perhaps permissible trespass is the occasional and fully understandable run in with a bull-headed and intractable traffic warden having a bad day). And what is it that white van man does that makes him relevant to our Veggiestan cooking? Well, it is he who brings us our supplies and distributes all those unusual foods all over the country. Small import and distribution companies do not and cannot operate a fleet of 40’ lorries – they rely on panel vans for just about everything, whether it be Turkish yoghurt, or Kashmiri greens, or Saudi dates, or Iranian pickles. WVM’s day starts typically with a trip to the airport to collect a load of goodies: after an hour of grappling with incomprehensible paperwork (incomprehensible unless your hard drive is wired directly to Brussels), he can ask his freight agent to submit a customs entry on his behalf (every product has a code and sub-code, and as these vary from week to week and according to what colour socks you are wearing, no-one in their right minds handles the entries themselves, but rather pays a nominal fee to an expert with the patience of a saint). Assuming customs don’t want to detain his cargo and search every nook and cranny, and also assuming that port health don’t wish to impound his goods for analysis (at his expense of course), his goods should be cleared – he will be instructed how much money to pay to the government in tax, to the exchequer in duty and to the EEC in levy. Once the bonded warehousemen have taken their fill of bits and pieces, WVM can then load his van and get on his way. If he is ‘lucky’ he will be distributing goods within the city adjoining the airport – but pity the poor soul that then has to drive many miles up the motorway to reach his target market. Prosperous WVM will be able to afford to employ a parking pixie to help monitor the vehicle whilst deliveries are made, and indeed to help unload goods – but the vast majority are on their own. Seven to eight hours on the road, battling the traffic, dodging the queues, trying to recall the parking restrictions outside each of his customers, collating orders in a very small space, haggling with the often appallingly ungrateful shopkeeper or his truculent staff – it is a hard day. And don’t forget that WV’s are not equipped with all mod cons – CD players and air con are luxuries. His deliveries over, he then has to return to HQ to refrigerate any unsold fresh goodies, ready the next day’s orders, write up his accounts…. How do I know all of this? Meet bright yellow van lady. Actually, I was white and pink van lady first, and then bright orange, and then we settled on yellow. Before we opened the shop, I spent around 6 (good, but awfully hard) years on the road with Jamshid. And for those of you who are worried about the planet, the food airmiles, the diesel fumes… Boris’ new regulations will outlaw a lot of the older culprits. And it won’t be long before the world becomes utterly homogenised anyway, so travel will no longer become an issue and the term exotic will lose some of its feathers. Global warming is bringing the tropics nearer, and migration is mixing us all up like never before. As long as WVM has his emissions checked regularly, he can’t be accused of doing any harm. He is not importing apples and pears, but rather the stuff that we cannot get, and that still will not grow here; and he is serving our growing band of ethnic communities. Yemeni melons? Mangoes in Milton Keynes? Daikons in Dunstable? You’ve got WVM to thank. He is, if you will, a herald of faraway cuisines and a harbinger of future times. So expunge all thoughts of newspaper stereotypes and give him a cheery little wave next time you see him. He works damn hard and deserves respect. 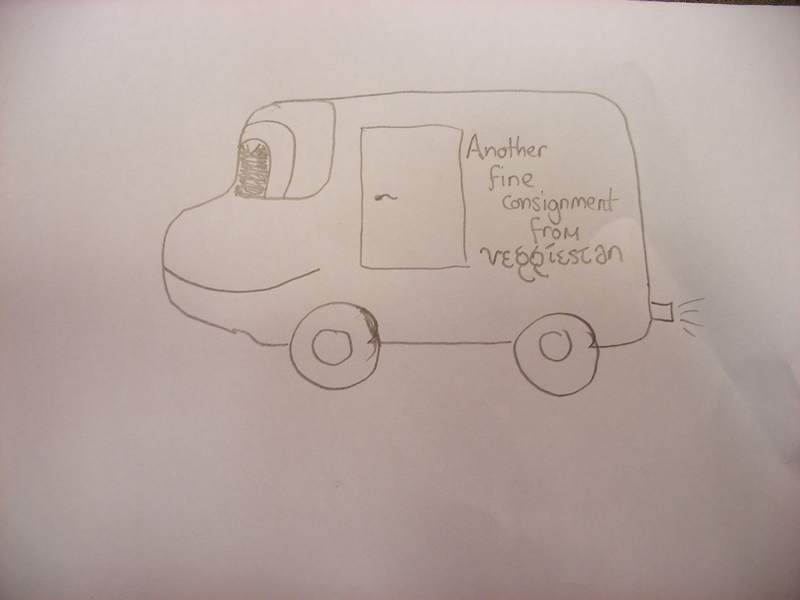 This entry was posted in Postcards from Veggiestan and tagged import and distribution, small businesses, white van man, WVM. Bookmark the permalink.